An Aboriginal boomerang is a throwing stick. Thrown into the air, it curves away from the thrower before arcing back and returning. 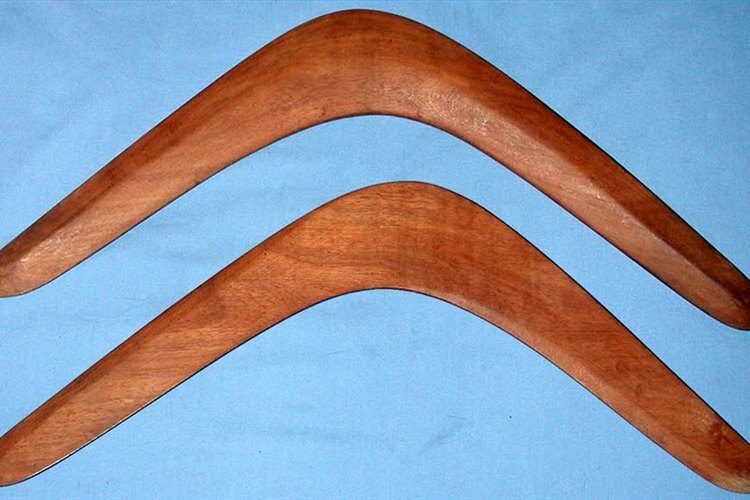 Traditionally made of a tree root, the native peoples of Australia used the boomerang to kill small animals and birds. Boomerangs come in a variety of shapes and sizes. The most common resembles a triangle. Use a small piece of plywood to duplicate the shape of the authentic Aboriginal device. Trace a roughly triangular shape on the wood. The angle at the apex of the triangle should measure somewhere between 95 and 110 degrees. The apex should also be somewhat rounded in appearance. Cut out the triangle. Draw a second and smaller triangle inside your triangular piece of plywood. The new triangle should be in a couple of inches from the edge of the wood. The boomerang needs to be just wide enough to fit comfortably in your hand. Make the apex of this triangle more noticeably pointed than the apex of the piece of plywood. Cut out this second triangle. You should be left with a strip of plywood of roughly triangular shape. Round the two ends of the boomerang. The ends should be approximately semicircular. Place one end of the boomerang in the steam of a coffee pot. Let the plywood soften and then bend it slightly upward and outward like a flap. Let the plywood dry and then repeat the process on the other end of the boomerang. Do not bend too much of the wood. The result should resemble the turned ends of a horseshoe, with the difference that these point slightly upwards. Sand the boomerang to make it smooth. Polish the edges as well as the front and back. Sanding will make your boomerang more aerodynamic. Make sure the body of the boomerang is completely flat. Press it or steam it if it has warped. Only the tips should be turned. Throw your boomerang by grasping one of the tips with the curved side facing toward you. Paint or varnish will add extra weight to your boomerang. This could interfere with performance. Do not paint or varnish it unless absolutely necessary.